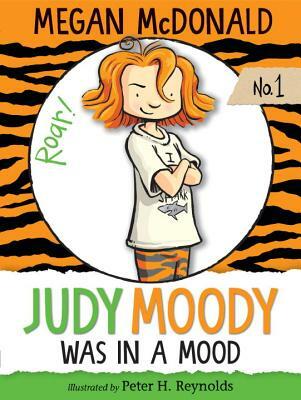 The mercurial Judy Moody will delight any kid who's known a bad mood or a bad day—and managed to laugh anyway. Megan McDonald grew up in Pittsburgh, Pennsylvania, with four older sisters, and she says that most of the stories in Judy Moody "grew out of anecdotes about growing up with them." In fact, she made Judy the oldest sister because she "wanted to see what it's like to be in charge!" Megan McDonald is the author of numerous children's books and lives with her husband in Sebastopol, California. Peter Reynolds is an award-winning animator, artist, author, Web site creator, and educator. Peter says he felt an immediate connection to Judy Moody because, "having an 11-year-old daughter, I have witnessed firsthand the adventures of a very independent-minded girl." Peter Reynolds lives in Dedham, Massachusetts. The book itself has a look as fresh as its heroine . . .The book opens . . . with a hilarious spread in pen-and-ink wash . . . the dialogue is spot-on . . . It's hard to imagine a mood Judy couldn't improve. ...[T]his beginning chapter book features large type; simple, expressive prose and dialogue; and plenty of child-appealing humor. Children will enjoy lively Judy and her diverse hobbies and adventures with best-friend Rocky. They'll also like the witty, detailed drawings (especially the picture of Judy's unique collage, a nice activity idea) . . . An entertaining story that portrays challenges and pleasures from a kid's perspective, and shows how making the best of things can have surprising rewards. Changeable skies arch over a third-grader's moodscape in this easy-reading chapter book . . . Reynolds's black-and-white washes are perfectly placed to track Judy's ups and downs . . . Surefire fare for Cleary, Kline, and Hurwitz fans. McDonald's offbeat humor coupled with expressive black-and-white cartoonlike illustrations make Judy, her family, and her friends both appealing and realistic. Fans of Beverly Cleary and the Amber Brown books should appreciate this fresh, energetic series about an irresistibly willful third grader. Judy is just, well, intense, in that at-odds-with-the-whole-world way typical of third graders . . . this large-type chapter book is immensely funny . . . Fuming all the way, Judy Moody rules.